Sending meeting reminders by email is extremely important. They help your leads know exactly what to expect from that meeting, when it’s taking place and where. You’ve done everything possible to get there, to finally get your lead closer to a great demo. You are even closer to closing a deal. But delivering a wrong or incomplete message could mean getting awful results, like losing thousands of dollars from a lead or missing a huge partnership opportunity. You don’t want that to happen. Email meeting reminders are just like any other marketing message: strategically important to specific audiences. It needs to be clear, personalized and make us react with a call to action. Do people respond in the way you expect? A frequent scenario is “I’ve sent out a meeting invitation but not everybody has responded yet” or “No one attended the meeting”, which is even worst. Let’s learn a few tips to help us deliver the right message every time we schedule a new meeting within our calendar and need to set up meeting reminders. During my first two years at college I “promised” myself that I wouldn’t be a journalist. I wanted all the crazy stuff related to the advertising world. I wanted to deliver powerful, creative strategies and content to achieve a client’s goals. Suddenly I realized how important it was to get all the skills a great journalist has. You see, newspaper headlines have several objectives. They grab your attention and give you a clear idea on what you should expect to know after you’ve read the article. Is it that similar to what an email subject line does? You’re right! If you are creating the structure for an automated personalized email meeting reminder, using well-chosen words will help your recipient know what the email is about. It will also help your lead memorize the key information you need to share. Do see the problem there? The subject line is too generic and empty. Meeting? When? Why? Who’s John? Subject: Reminder of Meeting on Personalized Videos – 4PM on 5 Nov.
Go straight to the point. What your lead expect is the practical information that will help him or her attend the demo or consultation. I just wanted to remind you about the meeting we have scheduled for Tuesday November 5th at 4:00 PM. You can join from PC, Mac, iOS or Android using this link [link]. We’ll be discussing how personalized videos can help your company generate more leads with a better ROI. Feel free to get in touch if you have any questions. Now that you know how to write clearer email meeting reminders let’s go one step further. Email meeting reminders should be called “email marketing meeting reminders”. They represent your chance to inspire your leads with part of the message you’ll share when the actual meeting takes place. Don’t lose it! Email marketing automation brings a lot of options to the table, with personalization to be one of the most wanted options by any marketers now days. That’s why E-consultancy Email Marketing Industry Census reported that 29% of marketers chose automated campaigns in their marketing strategies for 2015. You first send an email sharing information on the meeting. Now, depending on your industry, engagement levels and experience, you can automatically send another email to your lead sharing a specific value proposition. Sending another email with a personalized video to your meeting leads will help you emphasize the message that you will share in that meeting and will help you increase your lead engagement. Why a personalized video? It’s simple. If a picture is worth 100 words, how much is a video worth? A million? What could possibly happen if you can personalize any message in that video? Again, you are right. According to a recent report by Forrester, personalized video has been shown to increase email engagement levels by 10x and raise CTRs by almost 1000%. Will you miss the opportunity to get closer to your business goal? In case you want to know how I got to connect Sezion’s Personalized Video solutions with the Appointlet scheduling app, I created this how-to video. As marketers we need to take advantage of any occasion we get; every touch point counts, even if it’s a “simple” email meeting reminder. Considering your email meeting reminders a marketing tool will give you more valuable opportunities to share your messages and achieve your business goals when the actual meeting comes. You would be preparing your leads to hear you. 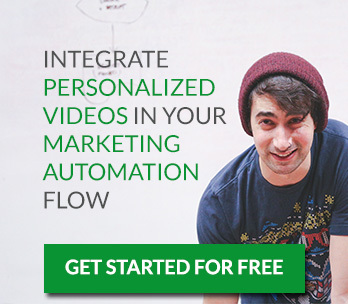 So, how about a quick call where I can do my best to help you include the power of personalized videos within your own marketing automation flow? Marketing tips, Personalized Videos email meeting reminder, marketing automation, personalized video. permalink.